Lunch at Locanda Cipriani is an experience to be savoured, but to be honest, more for the wonderful setting and the experience than for the food. On the tiny (and near deserted) island of Torcello, you can sip a Bellini on the terrace, look across to the 11th Century cathedral and stroke the house cats that know a good place when they find one. Or if it’s cold (as it was on our most recent visit) there’s a wonderfully homely room with a huge fireplace. But ideally you want to arrange the weather so that you can sit in the glorious garden. The world could be thousands of miles away. This historic venue, created in 1934 by Giuseppe Cipriani (who also founded Harry’s Bar and the Hotel Cipriani on the Giudecca) has welcomed many famous diners over the years, including Ernest Hemingway, Paul Newman and The Queen, seems to exist in a time warp. You have to make quite an effort to get there (it’s a long trip on the vaporetto, or an expensive but exhilarating experience in a water taxi – unfortunately the launch that used to ply between San Marco and the restaurant was cut some years ago). 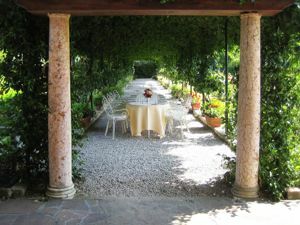 The service is fabulous but also friendly – dietary requirements are catered for with grace and a total lack of fuss, and children catered for without a blink (this is Italy, after all). We were entertaining friends there for Easter Sunday lunch and so had a traditional set menu – a choice of fish-based or lamb-based for €75 or €65 – the latter including a starter with prosciutto and a quail’s egg tart with parmesan sauce (very good, though the prosciutto was slightly dry), gnoccheti with wild boar sauce (excellent) and lamb chops with asparagus sauce and sautéd potatoes. It was good but frankly not exciting. When we first came here many years ago the cuisine seemed exquisite, but that was when it was quite easy to get a bad meal in Venice. Times have changed and there are many restaurants offering really exciting, innovative cooking; this revolution seems to have bypassed Locanda Cipriani. Puddings are from the maitre pâtissier and are pretty scrummy, including of course (as this was Easter) a Colombino filled with zabaglione and a wicked strawberry and cream meringue. The wine list is well balanced and extensive, and there are good buys that won’t break the bank – a Greco di Tufa at €20 was excellent and a Morellino di Scansano very smooth and chewy for around €25. In fact, Locanda Cipriani is surprisingly good value – its prices, that used to be very much on the high side, seem very reasonable now. It’s well worth the trip but I look forward to the day that they engage a new, young chef who will shake up the menu and bring it into the modern world.